The InfoWars YouTube channel received a "first strike" warning over a video suggesting that the survivors of the Parkland school shooting were coached and given lines for interviews with various media outlets following the Valentines Day massacre which left 17 dead. A second clip of Hogg which fueled speculation that he was a crisis actor features an exchange between Hogg and a Redondo Beach, CA lifeguard from 2017, in which the High School student places his boogie board on a trash can before getting in an altercation with the lifeguard. After the lifeguard scuffle briefly became YouTube's No. 1 trending video, YouTube removed it under their harassment and bullying policy and apologized for helping to fuel the "crisis actor" theory. A copy of the video above is still live as of this writing. YouTube's community guidelines say that if an account receives two strikes in a three-month period, it will not be able to upload content for two weeks. If three strikes are given within three months, the account will be terminated. Hogg, an aspiring actor, photographer, and drama student who has been backstage at CNN (and possibly on Air Force One?) hit back in a series of interviews, claiming "I am not a Clinton ploy or an actor," adding "I am a witness to this." Hogg also went on CNN to refute the claims, flanked by Anderson Cooper and his father - a former FBI agent, to shoot down claims that he is a paid actor. Further fueling speculation over a coverup has been the removal and strike issued over another video of Parkland shooting survivor, Senior Alexa Miednik, who said she spoke with suspected gunman Nikolas Cruz during the shooting. Miednik believed that a second shooter was involved in the attack, stating "There was obviously, definitely another shooter involved." When KHOU11 reporter Matt Musil then asks Miednik "Oh, you think he was not the only one? ", Miednik replies "Definitely not." While this video is being scrubbed from YouTube's platform, it can still be viewed on Twitter where it was originally uploaded. 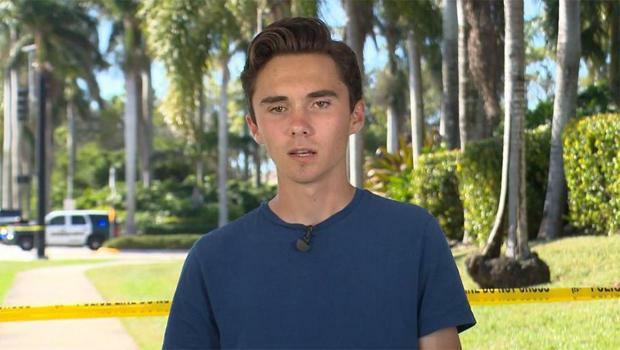 While Occam's razor suggests Hogg is nothing more than an enthusiastic young man in transitory pursuit of the media limelight, hopefully with a genuine message and conducting student interviews after a gunman was on a rampage at his High School - the seemingly overnight "pop-up" campaign against the Second Amendment revolving around Hogg, the video of Hogg flubbing his "lines," and an eyewitness who says she saw a second shooter have given fuel to the ongoing theories surrounding the massacre.